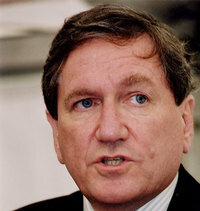 Richard Holbrooke was a US Ambassador to the UN under Bill Clinton. He is likely to feature in any Barack Obama administration, perhaps even as Secretary of State. In the main essay for the latest edition of Foreign Affairs he sets out 'A Daunting Agenda' for the next President. His two main concerns are: (1) the transfer of wealth to oil-rich and often threatening regimes and (2) the re-emergence of the Taliban and al-Qaeda within Pakistan. "With the price of oil quadruple what it was four years ago, Americans are witnessing -- or, more to the point, contributing to -- the greatest transfer of wealth from one set of nations to another in history... The United States consumes more than 20 million barrels of oil a day, about 12 million of which are imported. Based on prices from the first half of 2008, that means the United States is transferring about $1.3 billion to the oil-producing countries every day -- $475 billion a year... Saudi Arabia, which, although it has long worked with Washington to bolster world oil output and keep prices within an acceptable range, has simultaneously allowed billions of (ostensibly nongovernmental) dollars to go toward building extremist madrasahs and funding terrorist organizations, including al Qaeda. There will be more such complicated double-dealing in the future: Does anyone doubt that the current assertiveness on the international stage of, for example, Iran, Russia, and Venezuela comes from the economic muscle that accompanies their growing petrodollar reserves? (Venezuela now spends five times as much as the United States on foreign aid to the rest of Latin America.)" "As a recent New York Times article stated, "It is increasingly clear that the Bush administration will leave office with Al Qaeda having successfully relocated its base from Afghanistan to Pakistan's tribal areas, where it has rebuilt much of its ability to attack from the region and broadcast its messages to militants across the world." Nothing -- not even Iraq -- represents a greater policy failure for the outgoing administration." Ambassador Holbrooke also recommends two key policy departures to the next President: A greater emphasis on diplomacy and a switch of focus from democracy promotion to human rights promotion. "Coupled with his criticism of the Bush administration's deal with North Korea and his call to throw Russia out of the G-8, [McCain's] position suggests a deep, visceral aversion to talking to one's adversaries, perhaps stemming from a concern that such dialogue might be viewed as weakness. It also shows an innate skepticism of diplomacy as a frontline weapon in the United States' national security arsenal. Although both Bush and McCain attack Obama as weak, Obama's position is in fact closer to the traditional default position of almost everyone who has ever practiced or studied diplomacy or foreign policy. Even loyal pro-McCain Republicans, such as James Baker, Robert Gates (before he became secretary of defense), Henry Kissinger, and Brent Scowcroft have disagreed with the McCain position on Iran and Russia... The model that comes to mind, not surprisingly, is the one that President Richard Nixon and his national security adviser, Kissinger, used to open a dialogue with China in 1971, after 22 years of noncontact. Nixon's decision to talk to one of the most repressive regimes in the world, at the height of the insanity of the Cultural Revolution, came at a time when Beijing's treatment of its own population was certainly worse than that of Tehran today. China was also supporting guerrillas fighting U.S. troops in Southeast Asia. Yet Nixon and Kissinger talked to Mao Zedong -- and changed the world. (The way not to proceed is to emulate Reagan's move in 1987, at the height of the Iran-contra drama, when he secretly dispatched his national security adviser, Robert McFarlane, to Tehran carrying a chocolate cake decorated with icing in the shape of a key.)" "The next administration should focus more on human rights (a phrase curiously absent from the Bush lexicon) and basic human needs while still encouraging the development of democratic forms of government, accompanied by the evolution of a pluralist political culture, the rule of law, and improvements in material conditions, especially through job creation. If there is progress in these areas, democracy will follow, in ways that countries will determine for themselves -- with U.S. encouragement. That is the lesson of Chile, Indonesia, the Philippines, South Korea, Taiwan, and several promising young democracies in Africa."